John Calipari has had a rough week. There was the blowout loss to Duke on Tuesday, followed by news this morning that two of his Kentucky players were named in the FBI’s college basketball case. This afternoon, Calipari commented on the news that freshman PG Ashton Hagans was named as a target in the Christian Dawkins pay-to-play scheme. Calipari stated that the Kentucky compliance staff was very thorough in making sure that there were no issues with the recruiting process, so he is confident that there will be no problems. Former Kentucky star Jarred Vanderbilt, now with the NBA’s Denver Nuggets, was also named. Calipari on the report of Christian Dawkins having a list targeting Jarred Vanderbilt and Ashton Hagans among many other college players/recruits to pay: Kentucky compliance staff here is so thorough, he trusts everything is OK. Per the investigation report, Dawkins wanted to pay Hagans $2,000 per month from October 2017 to October 2018, and then increase the rate to $3,000 until April 2020. However, Hagans’ father refuted the report, stating that he never made any contact with Dawkins. As for Vanderbilt, the report indicated that Dawkins had plans to give the former Kentucky star a $100,000 line of credit, $30,000 to his family, and an extra $25,000 to Vanderbilt’s father when he turned pro. 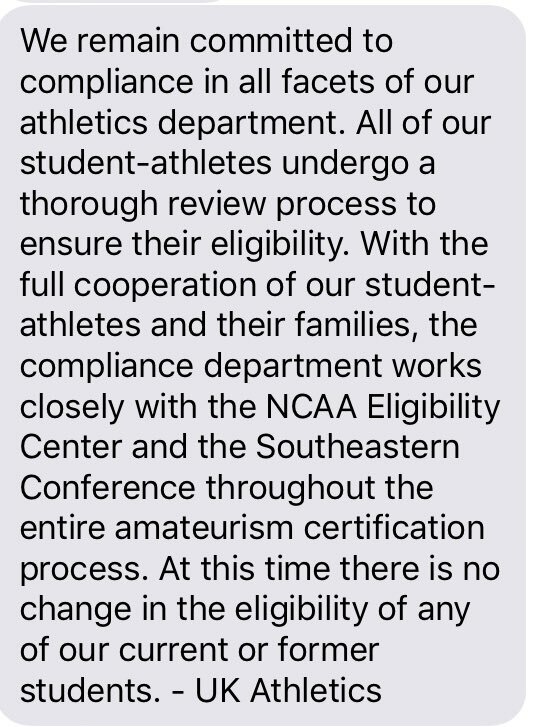 Kentucky released a statement shortly after Calipari, expressing confidence in the legality of their recruiting process.